Brought to you by BAD!SLAM!NO!BISCUIT! in partnership with the Ainslie and Gorman Arts Centres, the Salt Room is the poetry and performance night the Australian Capital Territory deserves. For this event we have Pascalle Burton (Brisbane), Adam Hadley (Brisbane), Suzanne Edgar (Canberra) and CJ Bowerbird (Canberra). 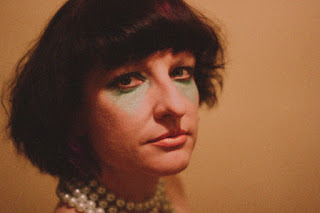 Avant-garde performance-poet musician-lady, whose experimental manoeuvres with words and sound are usually founded in cultural theory and have been described as an ‘elegant dragnet’. Pascalle has performed at venues and festivals, both in Australia and overseas. Current projects include The Stress Of Leisure, Letter.Box.Stamp.Collect., The Outlandish Watch project (with collaborators Nathan Shepherdson and David Stavanger), the Golden Stapler Award nominated The Lavender Room Zine-in-a-Matchbox series and the accessories label TWENTY FIVE SEVENTY FIVE for The Lavender Room. Her debut poetry collection A Vast Laugh was released through Small Change Press in 2008. This year in collaboration with Nathan Sheperdson she created UN/SPOOL. Adam Hadley is a story teller, performance poet & MC. With his partner Tessa Rose he has hosted at Woodford Folk Festival and performed poetry about Twin Peaks to confused G20 protestors. He is one of the hive minds behind Brisbane’s story-slam Bad Slam No Memoir, and has had work published by Seizure Online, black & blue and Fanciful Fiction Auxiliary. Suzanne Edgar’s recent books are Still Life and The Love Procession, both 2012. Her poems are in many anthologies including The Best Australian Poems 2004 & 2005, 2011, 2012 & 2015. An overview of her poetry and a current interview with her by John Beston are in Antipodes (Dec 2014) and may be read online. 'Moments of heartfelt tragedy combined with raw humour.' CJ Bowerbird explores what it is to be human, writing about things we have lost, things we never had and things that are slipping through our fingers. Most recently featuring at Woodford Folk Festival, CJ has performed across Australia, China, Indonesia and the US. He was the 2012 Australian Poetry Slam Champion and hosts Bloody Lips – Words of Passion, Spoken and Sung in Canberra, ACT.